Is PSTA closing in on a viable solution to the public transportation last mile problem? Pinellas County's PSTA has reached an agreement with ridesharing company Uber for a new early-morning/ late-night service named TD Late Shift. You can get more details from Janelle Irwin Reporter for Tampa Bay Business Journal in her article Pinellas transit expands one partnership with Uber, launches another. There is more info from PSTA at TD Late Shift. From the PSTA Web site: "PSTA first publicized its relationship with Uber earlier this year when the two transportation providers launched Direct Connect, a six-month pilot program that connects people to bus stops for a subsidized rate. Now, PSTA is expanding that program to span across the entire county offering unlimited, on-demand Uber and Taxi rides for approximately $1." If you have not been to the PSTA WEB site, PSTA.net check it out. Note the Google Transit trip planner, which I have used, and it is really great. These new initiatives are part of PSTA's ongoing efforts to resolve one of public transportation's major problems: the last mile connection, or more commonly stated as, "how do I get from my front door to the bus stop?" PSTA will also use United Taxi and Care Ride for disable customers of the TD Late Shift Program. I think these programs are great, and we should share the news so the people who need them know about them. The growing connections between Uber and PSTA come at a time when Uber is continuing to struggle with local regulations, especially in Hillsborough County. How well will the PSTA and Uber connections work out? Who knows but that is what these trials are all about. PSTA has done a remarkable job since the GreenLight initiative failed. They have been innovative and forward-looking and there are probably more programs like the Uber effort under consideration. 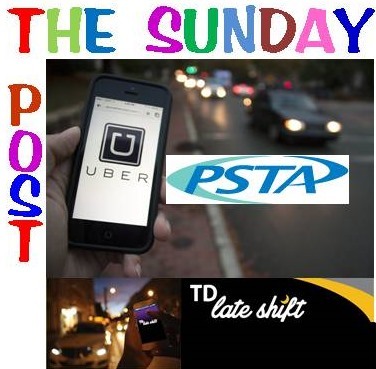 I for one hope the PSTA/Uber team is an outstanding success for both organizations and public transportation users. What I would like to see is an end-to-end application where I can order a complete trip. Pick up at my door, drop off at the bus connection, pickup at my bus destination and a ride to my final destination. All ordered, paid for and ticketed on one app, and a return initiated when I call for pick up when I am ready to return home. The hardware is all in place. No infrastructure needed just some creative thinking and a little software. My only word of caution is PSTA under Brad Miller's leadership has had a tendency to get carried away when they get excited about an effort or opportunity. When you are playing with the likes of Uber, you are playing in the big time and PSTA, and the PSTA Board needs to follow these developments and agreements closely along with the relationships between staff and Uber. Transparency is the key to success. These are good ideas. It would be a real shame to have them fall victim to or become tainted by some poor judgment.